Lake Oswego is a gorgeous place to live, but a yard isn’t always an option. It doesn’t mean you can’t entertain guests though. With a beautiful patio roof, Lake Oswego residents can have the extra space they’re looking for with a view that cannot be beat. Pioneer Roofers has been leading the way in patio roof installation in Lake Oswego for over 20 years. When you want durability, functionality, and beauty, you’re in the right place. Enjoy the benefits of patio roofs! 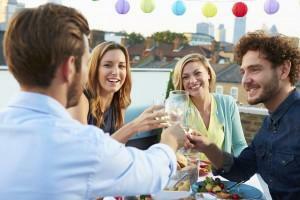 Entertain friends and family – One of the greatest reasons to choose patio roofing in Lake Oswego is for entertaining. You’ve always got a rooftop view, and during warm summer nights this can make for one memorable experience. We custom build every one of oojur patio roofs. We’ll help you identify your usage needs, and design your roof around your lifestyle. We can even include garden areas that save energy while attracting birds and insects. Reduce your maintenance costs – With patio roofs, Lake Oswego home owners enjoy reductions in maintenance costs over pitched models. Since it is easily traversed and viewed, you can perform many maintenance procedures on your own. Simply cleaning debris after a storm and checking for standing water is all that is required between professional maintenance procedures. Improve your roofs durability – Modern materials are incredibly strong. Lake Oswego patio roofs can last well over 50 years depending on what’s used to construct them. Our roofers will discuss materials with you, and find the right balance between cost and lifespan. Material life isn’t the only thing that adds to durability. With their minimal wind resistance, flat roofs can withstand strong Northwest windstorms much better than pitched roofs. Get the experience you need in a patio roofing company. With more than 20 years in the industry, we’ve helped hundreds of Lake Oswego home owners achieve their roofing goals. Working closely with our customers allows us to build according to their vision. We discuss important factors like material choice, layout, and future plans. That way you get what you’re looking for now, and can prepare for the future. Get the craftsmanship you want in a well designed patio roof. All of our work is performed using high grade materials by skilled craftsmen. Patio roofs in Lake Oswego need to do more than keep out the rain. Structural integrity is key and you need to trust your roof was designed with stability and strength in mind. We design to specific tolerances, and can discuss weight limitations and needs. Considering all the factors allows us to build a roof that keeps you, your family, and your guests safe. Keep out the elements with functional design. We know patio roofing. Every roof is designed with the necessary gradation and features required to repel and channel water. Properly constructed roofs like those built by our team are less prone to pooling. You focus on what you want, we’ll make sure it meets specifications for safety, longevity, and use. Contact us for patio roofs today! When you want a patio roof in Lake Oswego to exceed your expectations while meeting every need, call (503) 281-0305 or contact us today.